Writer Emergency Pack: Let’s Do This Together – Finish That Novel! Earlier I mentioned that I heard of a Kickstarter project that I wanted to share with you because it both looks awesome and seems like a great tool to help you finish that novel. Sometimes a good tip from a fellow writer is all it takes to get your novel to the next level. Sometimes one sentence about how to improve your writing can make a bigger difference than a whole book. That’s why for my Finish That Novel! book I’ve decided to try to pack in as many as these little goodies as I can. I know they make a big difference. That’s why I got really excited when I first heard about the Writer’s Emergency Pack on Kickstarter. Let’s get into some of the basic details of why I think this can really help you with your novel. Who? The person who came up with this idea, John August, is a writer. Not only that, but he’s a successful writer. He knows what struggles we face and he’s overcome them personally. If he has any advice, well, I want to hear it and I’m sure you do as well. Why? Because writers get stuck. It happens. I get stuck. You get stuck. We need help. What? The Writer Emergency Pack is like a deck of cards. On each card is a writing prompt or idea, something designed to get you unstuck. Exercises, areas to look at. 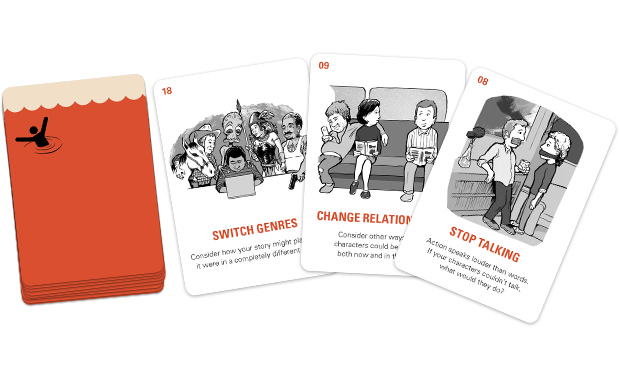 These are colorful cards with fun illustrations and concrete tips from one writer to another. When? November 20th is the deadline for backing it. It’s already well past funded, so grab it while you can! The packs are expected to come out in April. For those of you new to Kickstarter, that’s a pretty short wait! Where? Wherever you are. The shipping is free in the United States. How? However you want–going through the deck one by one or picking cards at random. You can be messy or methodological. A while ago I decided to get my own Tarot deck to use for writing prompts (and for awesome solitaire games!). I find it incredibly helpful. Whenever I need an idea of what to use next, I pick a card and study it and then find a way to apply it to my novel. But sometimes you need something a little more concrete than that. No tarot card is going to ask you what would happen if you switched genres or tell the story from the villain’s perspective. Plus, if you want even more than that, there’s also a set of “detail” cards that match up to the other card. These have related exercises to try. Take a look! I hope you like what you see as much as I do!